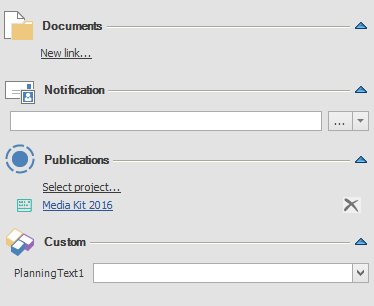 With the publication feature, you can use selected planning elements (i.e. activities and milestones) in other projects. There is a global annual department planning. The goal is to adopt activities from the global planning into other projects that take place during the year. If a change is made to the activity in the global plan this should be incorporated into the other projects. You want to incorporate milestones from a corporate milestone plan into projects of different departments. TIP If you don’t want to use individual planning elements in other projects, but set dependencies between two or more projects, then we recommend to create a project group. Please follow these steps to publish planning elements from a source project in a target project. Open the planning of the source project. 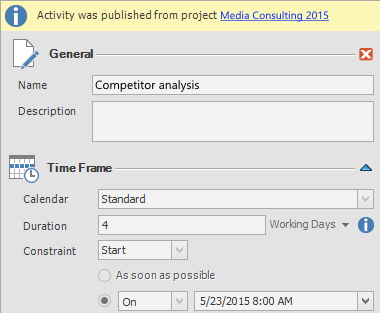 Mark the activity or milestone in the Gantt plan that you want to use in another project. Click on the Edit tab onto the Edit button in the Ribbon or double-click onto the selected planning element. In the dialogue Add to Project you’ll find all projects that you have a reading permission for. Select the target project. You are only able to confirm your selection with OK if you also have the permission to edit the planning of the selected target project. When the publication was successful, you will find a link to the target project in the side panel in the Publications group. If you want to delete the publication click on the black cross right of the target project. NOTE It is only possible to publish activities and milestones. The assigned work packages are only visible in the source project. Summary activities cannot be published. NOTE If an activity has already been published in another project, which the current user is not allowed to access, he or she will only see the remark “Project” in the Publications group. As soon as an activity has been published, an automatic notification will be sent to the project managers of the target project – unless this feature has been deactivated in the source project. In the Planning section, on the Settings tab, activate the button No Notifications. In the InLoox options, you’ll find the regarding notification templates which you can edit according to your needs. TIP Please see the section Notification Templates to find out how you can adjust notification templates according to your needs. 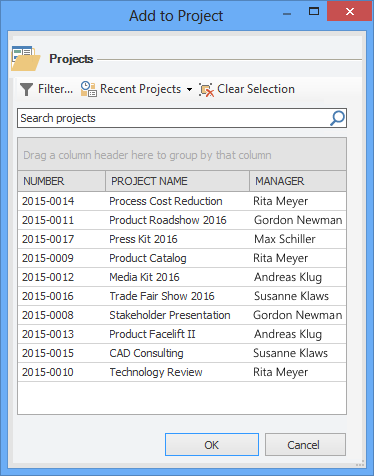 You’ll find planning elements that have just been published in the target project at the end of the Gantt plan. Now you can move them manually to the place where you want to use them in the plan (by using the arrow buttons in the Ribbon on the Edit tab). Published elements are marked by the following symbol in the Gantt plan. Published elements can be used just like “normal“ planning elements in the Gantt plan, i.e. you can create dependencies between them and the other planning elements. 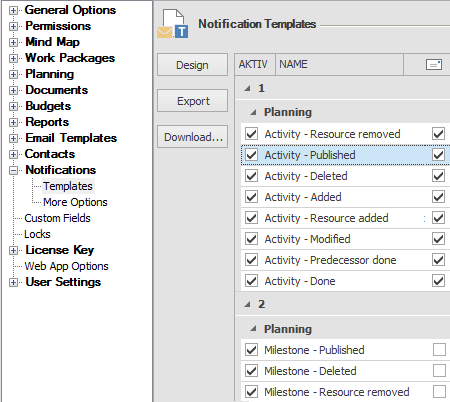 Double-clicking onto the published planning element in the target project will open the side panel where you will find the notice that the regarding object is a published activity from another project and a link that leads you to the source project. By clicking onto the link you’ll get directly to the source project (provided that you have reading permissions in the source project). Only there you can edit or delete the published element. IMPORTANT A published activity can only be edited in the source project and will not be displayed if you take a snapshot in the target project. A planning element can only be published from the original source project of the activity. Further publications into third projects are not possible. TIP Use the filter Current Project to blank published elements from the target project. In the course of project planning it is possible that team members edit a published activity in the source project. This might affect the planning of the target project. In this case, you will find a notice when you first open the planning after the change has been made. The planning can be adjusted automatically. Activities and milestones that depend on the published elements will be moved accordingly. The rest of the planning is not affected. Use planning elements in other projects • Copyright 1999-2019 © InLoox, Inc. All rights reserved.